This is my second review of a crocodile strap from Lac Crado. 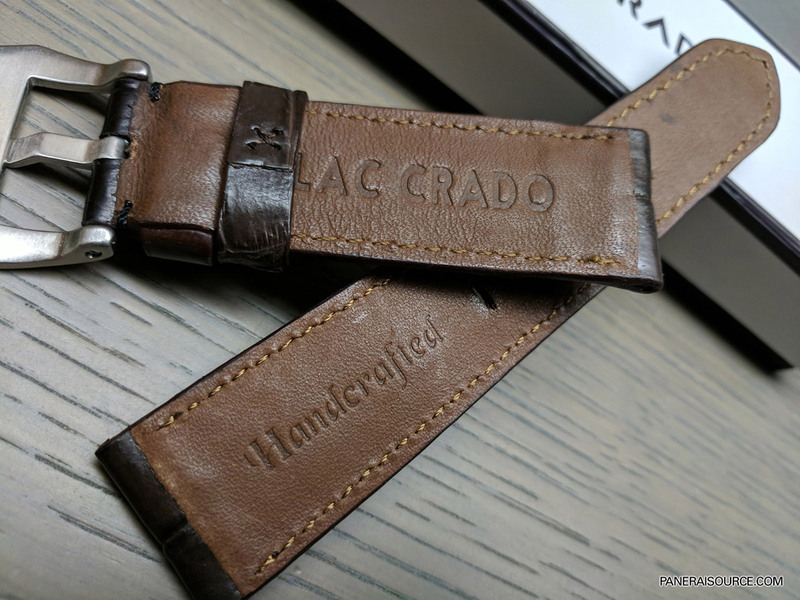 In case you didn't read the earlier review, Lac Crado is a strapmaker based in Singapore that produces primarily Alligator and Crocodile straps as well as other exotic straps. They also produce straps for AP, Bell & Ross and other brands of watches. This is a much toned down version of their usual straps, which is probably more to my liking in general so it works. The model reviewed is their Mocha, which features a beautiful large scale Crocodile belly hide with a fantastic brown patina color. The scales are very large and of excellent quality - free from the scarring that lesser quality hides often have. Their hides are sourced from a variety of locations including the USA, France, Italy and locally in Singapore. 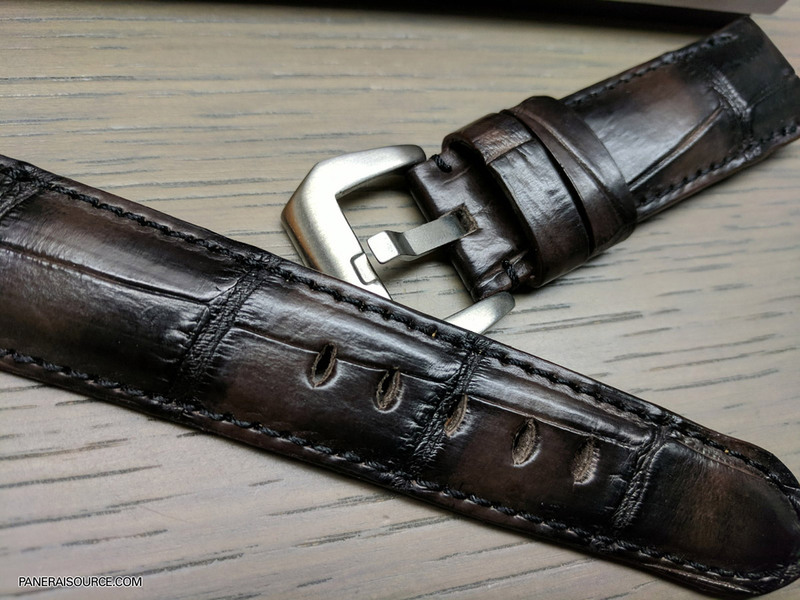 The strap features a tapered design with a padded construction that is similar to that of the OEM Panerai straps, though with a bit more of a rugged feeling lacking perhaps that bit of delicateness that you see in the OEM straps. This is probably more of a personal preference. It comes packaged in a nice box, and features matching dark brown stitching. One area where I wouldn't mind seeing some improvement is the stitching holes. If they were a bit smaller I think it would have a cleaner look, but this is a minor criticism, especially consider the price of these straps. This exact crocodile strap under review is only $169USD which is a very solid price for the level of quality. 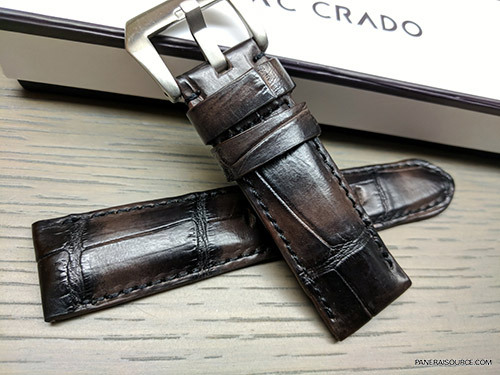 The buckle is a standard issue bent buckle, but without the Lac Crado engraving that I saw on the photos on the website. So your strap may or may not come with that marking on the buckle. You can replace the buckle with the OEM buckles on this straps so long as it has the same shape/size. It also has double keepers, one fixed and one floating, just like OEM. So basically, this strap makes a great 24/22mm OEM replacement should that be what you're looking for. 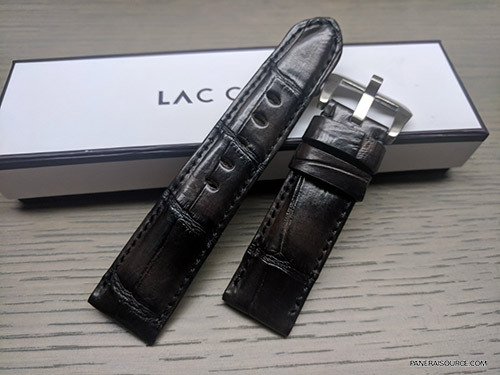 The back of the strap is lined with a soft medium brown calf skin, so that it is comfortable on your wrist. And comfortable it is. They are also stamped with "Lac Crado" on the short side, and "Handcrafted" on the long side. The strap is very pliable, and while a little stiffer than OEM, its plenty soft and you shouldn't have any trouble breaking it in. Even the padded parts comform pretty well to my wrist. Overall an excellent strap, another great alternative for drop-in OEM replacement Crocodile strap that offers better value than factory. This also has a slightly different feel and vibe to it than OEM as mentioned. Its a bit more rugged, and a little bit thicker. Good especially if you find the OEM straps too thin. Hope you enjoyed the review!